When it comes time for you to get a new garage door installed, you may become overwhelmed by the wide variety of choices available. There are some things you will need to consider to determine whether a door that catches your eye will be a good fit for you, and we've detailed some of them below. Since there are many different standard sizes available for you to choose from, you will need to determine your specific requirements. 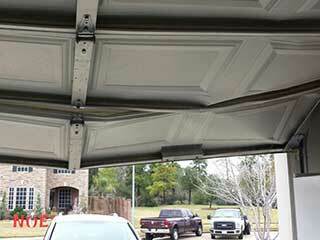 Take a measurement of the height and width of your garage's opening. If you have a particularly tall or wide opening, you may require additional panels to fill the gap, so you will need to select a model which has this option. Many doors can be custom-built per your specific measurements, so even if you find that a certain model isn't a perfect fit on paper, it's worth it to check and see if it can be altered. Headroom is the amount of space between the ceiling and the very top of the garage door. All models will require some degree of headroom to accommodate their opening and closing action. In many cases, the type of springs your door needs will determine the amount of headroom required; extension springs usually require about eight and a half inches, while their torsion based counterparts need a minimum of twelve. Of course, this can change if you have an opener installed. Not only does an opener increases the backroom and headroom requirements, it also influences your door options. Unless you're planning on replacing your old unit (which is a perfectly viable option) you will need to make sure it is capable of powering the movement of your new door. The material it is made of will determine how heavy it will be. Aluminum is the lightest, while steel and wood tend to be the heavier types. It is worth taking the time to carefully consider your options and not rush into making an uninformed decision. Our team at Garage Door Repair Lawrenceville will be more than happy to answer any question you may have, as well as to help you find the perfect door for you. As one of the best garage door service providers around, our company firmly believes in meeting our customers' expectations to their fullest. That means going well out of our way to make sure the experience is a positive one, especially when the scenario is less than ideal, as is usually the case with broken springs and other issues. Feel free to browse the rest of our website to learn more about us. Our technician will contact you before arriving. Until then, feel free to browse our website! Garage Door Repair Lawrenceville is at your service!